Rita Henuber | Contemporary Women's Fiction and Romance » Today is the Marine Corps Birthday. OOORAH! Today is the Marine Corps Birthday. OOORAH! On November 10th 1775, in Philadelphia, the Continental Marines were first charged with fighting on the land and the sea. Happy 241st Birthday to the men and women who are serving and have served in the United States Marine Corps. 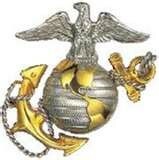 The Marine Corps emblem is the Eagle, Globe, and Anchor. The eagle with spread wings represents our proud nation. The globe points to worldwide presence. The anchor stands for naval tradition. Together, they represent a dedication to service in the air, on land and at sea. Some Marines will tell you they stole the eagle from the Air Force and the rope from the Navy. On the seventh day while God was resting they over ran his parameter, stole the globe, and have been running the show ever since. Much has been said about the Corps. Some I can’t repeat. Here are a few I can. Famous Devil Dogs are John Glenn, Bea Author, Drew Carey, Lee Marvin, Gene Hackman, Harvey Keitel, and George C Scott. Please tell us the name of your favorite Marine in comments.